I started the Daisy Christmas party our first year. It was small. We only had one employee at that time. So, the two of us took our husbands and had dinner on the San A ntonio Riverwalk. I wanted the Christmas Party to be special, and I vowed that I would do it each year. It wasn’t long before we were getting quite a large group that included drivers, wash rack people and office staff. I started doing it at my house and each year it got bigger. I decided that this would be my gift to all my employees. One way I could serve them. Each year, I took a week off and did all the cooking, decorating and anything else that needed to be done. 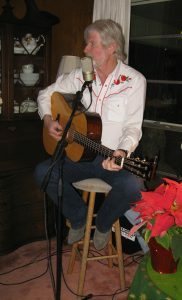 I got a fabulous entertainer to sing, George Chambers. He made every party. My employees had taken care of me all year and on this night, I served them and waited on them hand and foot. 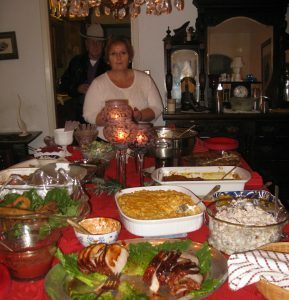 The meal was fabulous – 9 appetizers, 7 meats, 13 side dishes and a table full of desserts that changed every time one would run out. (18 in all). Then I added a margarita machine. We made sure no one was scheduled to work that evening so all of them could enjoy it. They came with their families including children. Upstairs was a game room for the kids to enjoy. Our crew loved it. Pretty soon we were adding tour guides and special friends. As the years went by, it grew larger and larger. At one party, we had 142 people. My house is not huge, but there was food and people everywhere. With the party so large, I needed help. My children and daughter-in-law joined in and helped me with everything. 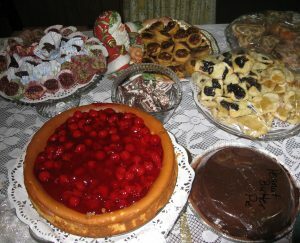 Following is a menu from one of our parties. 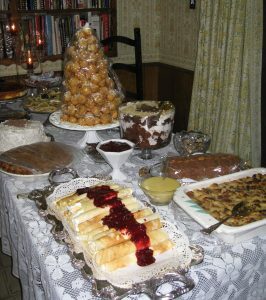 The menu varied slightly from year to year, but this represents a typical menu. The White Wings were always on the menu and probably our most requested item. I don’t know who enjoyed the Christmas Party more, me or the staff. We all looked forward to it. It was a joy to do for them. Drinks: Beer, Wine, Margaritas, Kahlua Eggnog, Regular Eggnog, Punch, Sodas and Coffee. Read more about life’s celebrations in June’s book, You Are Driving Me Crazy.